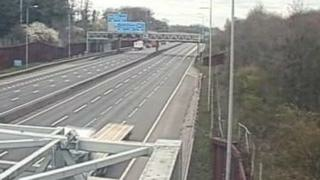 A woman in her 80s injured in a crash that closed the M25 motorway for more than eight hours has died. The collision, involving three cars and a lorry, happened at junction 20 for Kings Langley, Hertfordshire, at 11:55 GMT on Wednesday. A man, also in his 80s, remained in hospital after sustaining serious injuries, police said. Traffic officers have appealed for witnesses or anyone with dashcam footage to get in touch. The clockwise carriageway - where the crash involving a Citroen C3, a blue Nissan Qashqai, a silver BMW and a lorry took place - was closed from junction 19 for Watford. PC Neil Crosier, from the Bedfordshire, Cambridgeshire and Hertfordshire Road Policing Unit, said: "My thoughts are with the woman's family who are being supported by specially-trained officers. "If you saw the collision, or the events leading up to it, please get in touch."